Feeling paint between their fingers and smelling play dough while squeezing it into a small tube are ways that children learn about cause and effect relationships and problem solving. It also is the perfect means to incorporate fine motor strengthening and control into play opportunities. All children need access to the experience of self-expression and creativity that art brings to early childhood development. Predicting, planning, trialing, and making mistakes is a developmental stage necessary to a child’s cognitive development. For children with disabilities that affect their fine motor or upper extremity gross motor abilities, art projects can be a major challenge. Teachers must ensure that these activities can be accessible and enjoyable for all children, with and without disabilities. The following are a few ways in which we can set up the environment and adapt materials to bring these experiences to life. Children with physical challenges may need help stabilizing their bodies in order to focus on a fine motor task. Using positioning equipment such as standers, chairs with straps or cushions will help them have more control over their arms and hands. 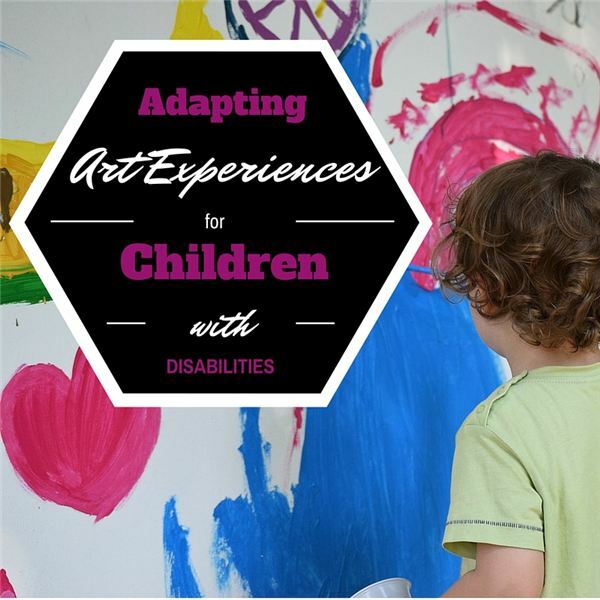 Having them complete their art experiences in an atypical position, such as prone, may help children with sensory needs. Children with difficulties bending over the work surface may need their paper or other materials placed at a higher surface or angle. A slant board can be used to provide for a more vertical placement and easier access for arms that cannot fully extend forward. Placing the art materials on a small bench which is placed upon the typical workplace can raise the surface to the child’s level and ensure better access. For children with the most severe motor challenges, attaching a paintbrush to a movable toy and using a switch to hit in/off can give them some independence in painting. Provide hand-over-hand support if necessary to demonstrate the skill and help with motor planning, but be careful not to take over for the child. A variety of mediums and opportunities for choice making will allow children with disabilities to engage in a more meaningful manner with their work. For children with visual challenges, giving textured art mediums can help them to distinguish between different paints and paper. For example, adding glitter to paint or using sandpaper for paper options will help them identify what they are using. The use of 3-D art mediums such as clay, play dough, cardboard and small bits of wood can also be beneficial for children with visual challenges. They can feel their creations as they evolve. Taking photos of the materials and placing them on a black background can help a child who is non-verbal to make choices by pointing or using their eyes to look at the color or material they would like to use. Having a wide variety of art utensils available will help ensure children can manipulate and control their work. Kids with decreased grasping skills can use paint brushes wrapped in thick foam tube. Wrapping rubber bands around a handle can increase the ability for a child to hold onto the brush. Small paint brushes with flat ends can be purchased commercially, along with adapted scissors and specially made crayons that are short and round to fit inside the child’s palm. Adding a tennis ball with holes cut out over the length of the pencil can also help with grasp. Try using a small Velcro strap with a hole cut out and wrapped around the child’s hand to allow markers to remain in his or her hand while swiping across the paper. Using non-traditional materials can also be helpful. Bath sponges on long handles, rubber basting brushes and feather dusters are alternative items that can help children reach, be more independent and have more self-directed control over their work. Heavier utensils may be needed for children with tremors or ataxia concerns. Children with physical disabilities need extended time to complete tasks. Moving their bodies takes more thought and effort than it does for a typical peer. Giving them time to make choices or to focus on moving their arms and hands requires appropriate support from adults with wait time for them to respond. Teachers must provide authentic art opportunities for all the children in their classroom. By observing and trying new things, it is possible to create opportunities for children with even the most severe disabilities to actively participate and engage creatively with art. Open-ended art opportunities allow them to feel successful with any amount of effort, no matter how small it may seem to others. Encourage and praise their efforts, provide physical supports when necessary, and allow for a variety of choices and mediums for children with disabilities and the children will have beautiful artwork to be proud of! Moomaw, S. & Hieronymus, B. (1999). More than Painting. St. Paul, MN: Redleaf Press.